The Spitzer Space Telescope recently conducted a First-Look Survey (FLS) covering about 5 square degrees centered on J2000 RA = 17h 18m, DEC = +59d 30' in order to characterize the extragalactic infrared sky two orders-of-magnitude deeper than the IRAS survey. In our Galaxy, interstellar dust produces far-infrared (FIR) "cirrus" radiation which is well correlated with 21-cm radio line emission from neutral hydrogen (HI) gas. 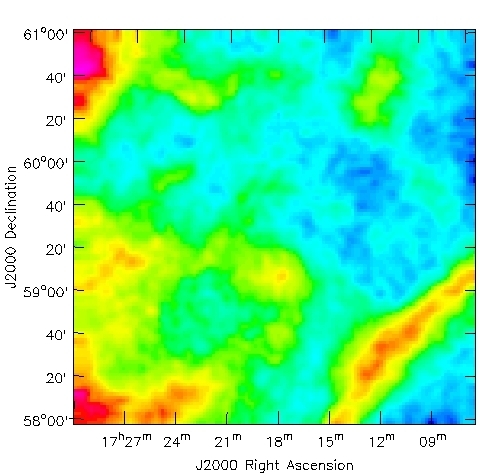 Thus high-quality 21 cm HI data from the FLS area can be used to estimate foreground cirrus contamination which might confuse observations of extragalactic FIR sources. The combined HI and FIR data are also valuable for studies of the interstellar gas and dust in our Galaxy. We used the 100-m Green Bank Telescope (GBT) to image the 21 cm Galactic HI emission line with 9.8 arcmin angular resolution and 0.62 km/s velocity resolution over a 3 deg by 3 deg square centered on J2000 RA = 17h 18m, DEC = +59d 30'. In the central square degree of the image the average column density is N(HI) = 2.5 X 10^(20) cm^(-2) with an rms fluctuation of 0.3 X 10^(20) cm^(-2). The Galactic HI in this region has a very interesting structure. There is a high-velocity cloud, several intermediate-velocity clouds (one of which is probably part of the Draco nebula), and narrow-line low velocity filaments. 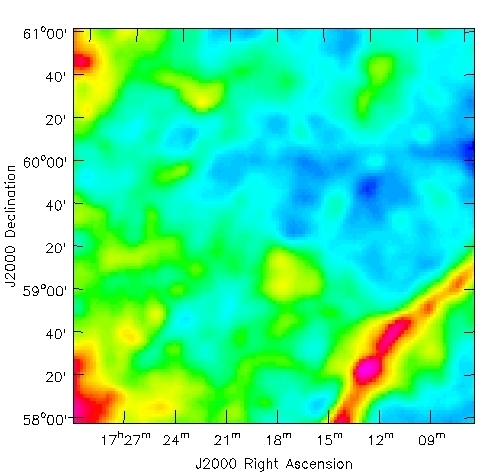 All except the high-velocity cloud have counterparts in existing far-infrared maps. The nearly identical pair of false-color images at the top of this page compare the FIR cirrus at 100 microns (left) with the HI column density (right), excluding the FIR-quiet high-velocity cloud. Relatively high E(B-V)/N(HI) ratios in some directions suggest the presence of molecular gas. The best diagnostic of such regions is the peak HI line brightness temperature T, not the total N(HI): directions where T > 12 K have E(B-V)/N(HI) significantly above the average value, implying a substantial dusty molecular component. For a detailed description of the FLS/GBT HI survey, see the preprint (Lockman, F. J., & Condon, J. J. 2004, AJ, submitted). If you publish results based on the GBT HI data, please reference this paper. The calibrated and corrected HI brightness data are available as a FITS-format RA/Dec/Velocity cube . (Reminder: shift-click will generally force your browser to save the requested image to a file rather than displaying it in a text window.) The FITSview family of FITS image viewers is available for a variety of computer systems. For a short discussion of installing external viewers for FITS files click here. Two HI column-density cubes were derived from the brightness cube: a spin-temperature T = 80 K cube and the other a spin-temperature T = 10000 K cube.